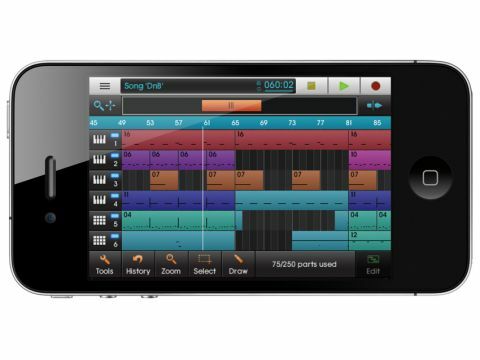 A powerful music production environment for iOS, NanoStudio is what you've been waiting for. A genuine mobile DAW. Great synth. You can import your own samples. The dream of creating full productions on our mobile devices is gradually becoming reality, as exemplified by the much-anticipated NanoStudio. With six tracks of sequencing in the familiar piano-roll style, a sampling (and resampling!) drum machine and four instances of a superb synthesiser, it really is a (basic) virtual studio in the palm of your hand. To start things off, there's the TRG-16. You get 16 pads into which you can load the factory sounds or your own WAV files, which can be imported using the free desktop NanoSync app. Stereo and mono samples are supported, there's a sample editor, and you can record from the iPhone's (mono) mic. Oh, and you can resample NanoStudio's output. Very slick. You can record TRG-16 parts live or use step-entry, and there's a knob for controlling velocity. TRG-16 has three output busses to cater to your mixing needs. Eden is NanoStudio's synth. A subtractive instrument that can work as a VA or wavetable synth, it's a real knockout. You get 128 great patches, but you can roll your own as well. Filters, envelopes, LFOs and dedicated effects are all here. Blip hasn't cut any corners here, and it shows. Eden sounds marvellous - big basses, shimmering pads and screaming leads. The eight-channel mixer has two aux effects: reverb and chorus/delay. Tunes can be zapped over to your Mac or PC via Wi-Fi and NanoSync. NanoStudio is truly terrific, and capable of producing serious work. It's easy to use, full of well thought-out features and sounds great. More than any other app, it lives up to the wild expectations we have of iDevices. Compression and EQ are notable by their absence, but that aside, this a definite must-have.